Figs digest wasps… it’s true! Figs have digested wasps in them! This jaw-dropping statement (for some) arose after I was asked what ingredient makes the perfect salad. For me, it’s all about the lusciously sweet fig with its chewy flesh, smooth skin and crunchy seeds. Unlike other fruits, figs are uniquely different in that their flowers blossom inside the actual fruit itself! It is these tiny flowers that produce the crunchy edible seeds that give figs their unique texture. Some fig varieties need to be cross-pollinated which happens thanks to an extremely small wasp. She squeezes her way through the ostiole (the only opening in the fruit which you will find at the bottom) to lay her eggs inside. As the female wasp slides through the narrow passage in the fig her wings are ripped off (egg laying is a one-way mission). But don’t worry. 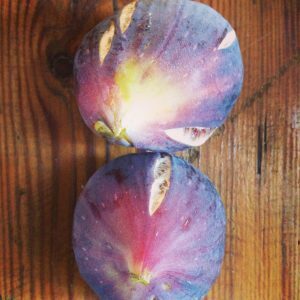 The fig you are eating does not contain eggs or wasps. Instead the hatched males, who are born sharp-toothed but wingless, chew holes through the fig’s skin for the winged females’ escape (not before mating). Parenting duties fulfilled, the males die. Special enzymes within the fig digest the now-flightless wasps, trapped inside the ripening fruit. Meanwhile the female wasps, covered in the pollen of the fig’s flower from which they have just escaped, find another fig to lay their eggs and successfully pollinate that flower as they wedge their way in. And so the cycle continues. Fascinating stuff, hey? I am enjoying the last of the fresh figs in my garden as the autumnal weather arrives. (I have dried plenty of figs for the winter months). This ‘From Paddock to Plate’ fig salad is one of my favourites. Combine washed rocket leaves, with sliced ripe figs and crumbled goat’s cheese. Drizzle olive oil and sprinkle with mint and a good squeeze of lemon. I also enjoy fresh figs with labne made from sheep milk, avocado, prosciutto and pomegranate. P.S. Find the full fig salad recipe on the ‘Recipes’ page of this website.